Shortly after the end of the Civil War, cattle ranching in the United States went corporate. Gigantic herds were driven hundreds of miles from summer to winter feeding grounds. Hundreds of cowboys were employed to take care of all these cows and could be out on the trail for months. To keep themselves fed, they took with them a cook and a chuck wagon. The chuck wagon has become a permanent fixture of the American west. These mobile kitchens had to carry virtually everything to put together meals for dozens of hard working men, sometimes for weeks on end without restocking. Unfortunately, it wasn't all that good. Meat was scarce since the cowboys couldn't touch the cows and fresh ingredients were few and far between. Fortunately for us and for Texas, there was a big need for immigrants in the early days. Sam Houston encouraged people from Europe to come to Texas and help make it a state. Many of these immigrants were German, and many among them were butchers. In the old days a butcher didn't just cut meat, he made sausage and he did his share of cooking. With the large supply of beef in Texas, German butchers started making sausage and they also figured out the secret to turning a tough and almost worthless brisket into a tender and flavorful meal. Of course, brisket didn't find its way to a smoker for many years. Early Texans cooked brisket in dutch ovens. 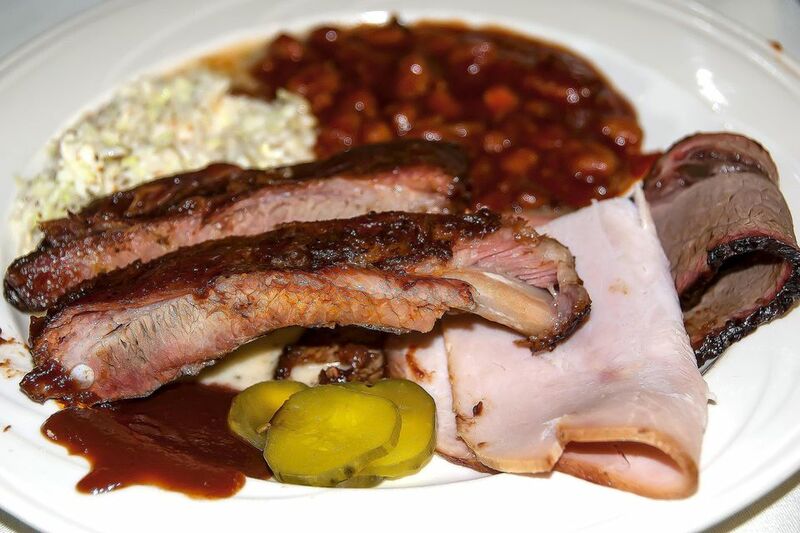 Today, Texas barbecue has become a blending of these traditions with an import from the midwest (pork ribs) as part of a great meal for any occasion. This is a meal with a lot of meat. So to set up a great Texas Barbecue menu start with smoked brisket, add some sausage and ribs and finish it off with beans and potato salad. Serve it up with some iced tea and lemonade and you've got pretty much everything you need. Of course, if you aren't ready to spend 20 hours smoking a Texas Brisket, head over to the steak aisle. Personally I like a good, thick rib-eye, but you can grill up whatever steak you choose. Just dish it up with all the barbecue favorites and enjoy a fantastic meal. Now, be careful. You don't want you Texas Barbecue steaks coming from just anywhere. Try buying real Texas Steaks from Texas. Lone Star Steak Company has some really good steaks. For decorations, keep it simple. If there is anything fancy on the table you are missing the point. Back in the 1960's President Johnson hosted several barbecues at his ranch in Texas. These events were typically catered by Walter Jetton, a crusty old chuck wagon cook who knew his barbecue. Guests, which included heads of states, ambassadors, senators and royalty were seated on logs, given over sized red checker napkins and served food on paper plates and tin cups. This is how Texas Barbecue is done.